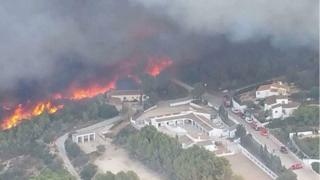 Spanish firefighters are combating a huge forest blaze on the Costa Blanca that has forced the evacuation of thousands of people including tourists. 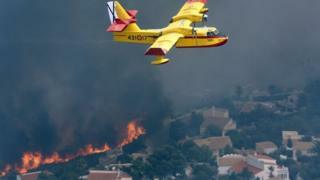 More than 300 firefighters have been deployed to tackle the flame some 120 km( 75 miles) south-east of Valencia. 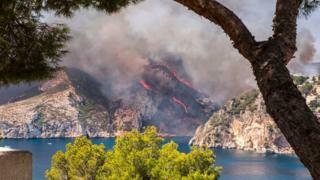 Three fires were intentionally started on one of the most wonderful days of the year, emergency authorities have said. 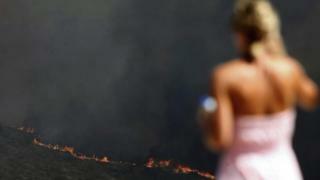 The temperature in some places is 40C, but officials hope breezes that fanned the flames will decrease. 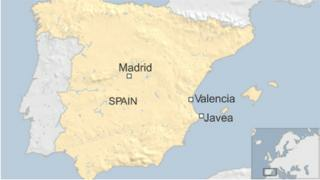 “Everyone is coming together”, Jeremy Kenton, a British osteopath working in Javea, told the BBC. 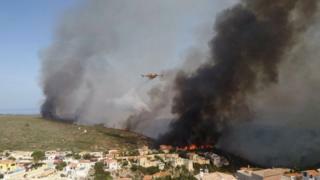 “Evacuation tents are being set up in schools, the fire brigade has come from as far north as Valencia, seaplanes are literally swooping down to the sea and then fly in strange slants towards the mountains to drop water. “The pilots are simply outstanding, ” he said. Although the flame has burnt out where he lives, there are fears it could start up again as the wind comes up in the evening and the planes can no longer drop water. The mood is one of “British stiff upper lip” and a “laid-back Spanish attitude”, Mr Kenton says. Valencia emergency services head Jose Maria Angel told Spanish radio that he believed three flames that rent through vegetation and destroyed buildings were due to “the hand of human … in a very precise way”. He told reporters aircraft were dumping water on the region every four minutes. About 65 vehicles were also deployed. On Friday, the 19 th stage of the Vuelta a Espana, a three-week cycling race, is scheduled to take place in Javea. In December more than 120 forest flames broke out in northern Spain , some of which officials said may have been started deliberately. Are you in the area? Have you been affected by the flame? If it is safe to do so let us know about your experiences. Email haveyoursay @bbc. co.uk with your stories.